Usually I don't bother looking at Ponychan's /collab/ board, since most of it is just ponies asking for help on projects that never get past the planning stage. Given the recent lack of news I was feeling rather desperate, and I decided to browse the board to see if I could find any interesting fangames. I found several, and the first of which is a game simply titled Apples. 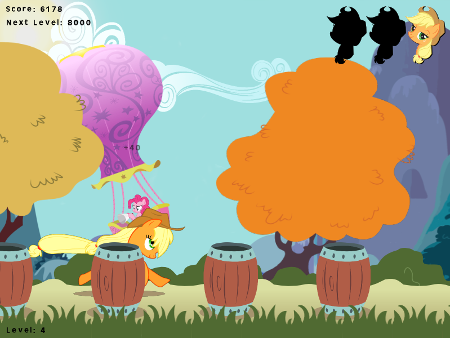 As you may have probably guessed, it is about Applejack, and as with most games about her it is not a platformer. Pretty much all the player has to do is collect apples and dodge barrels, and as the player collects more points the game moves at a faster pace. Is it worthy of a review? Not really, although it's kind of fun to waste a couple minutes on it. We'll have a couple more games to post today, which may be more or less substantial than this one.